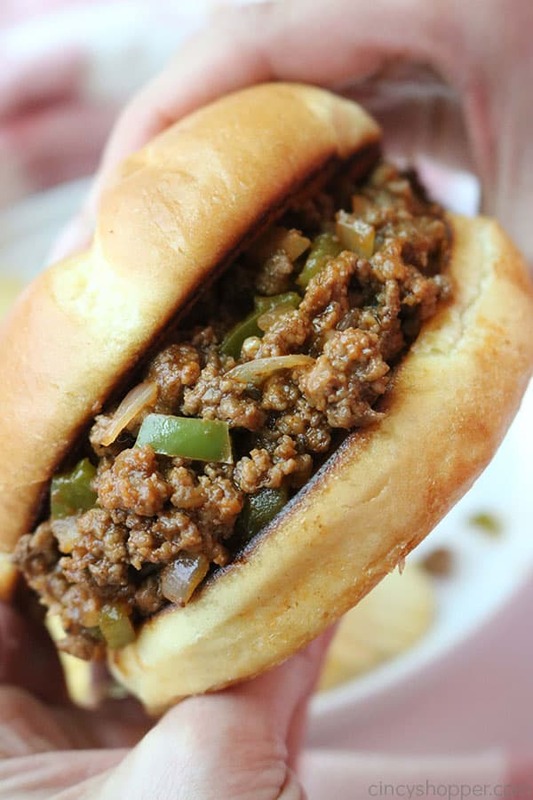 No need to use store bought when you can make The BEST Homemade Sloppy Joes right at home. 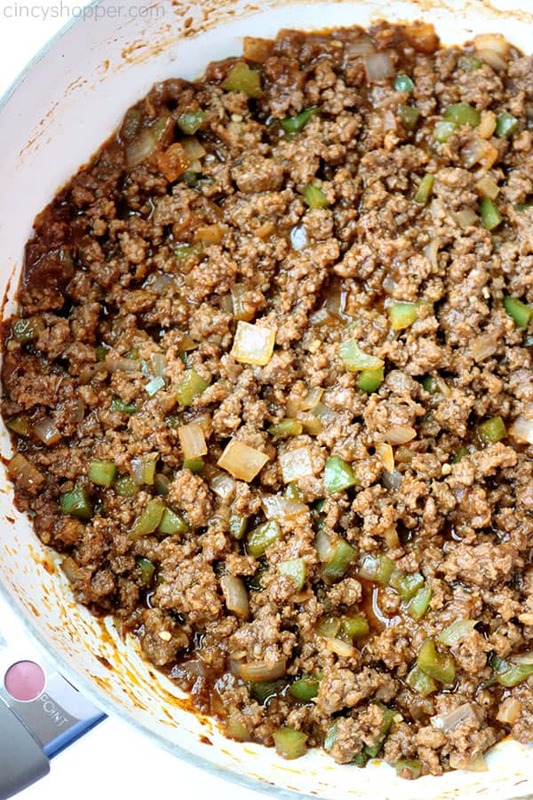 My recipe uses simple ingredients from your pantry for an easy ground beef dinner. If you are anything like me, you are always looking for easy ground beef meal ideas for dinner. Busy weeknight dinners can become a challenge. 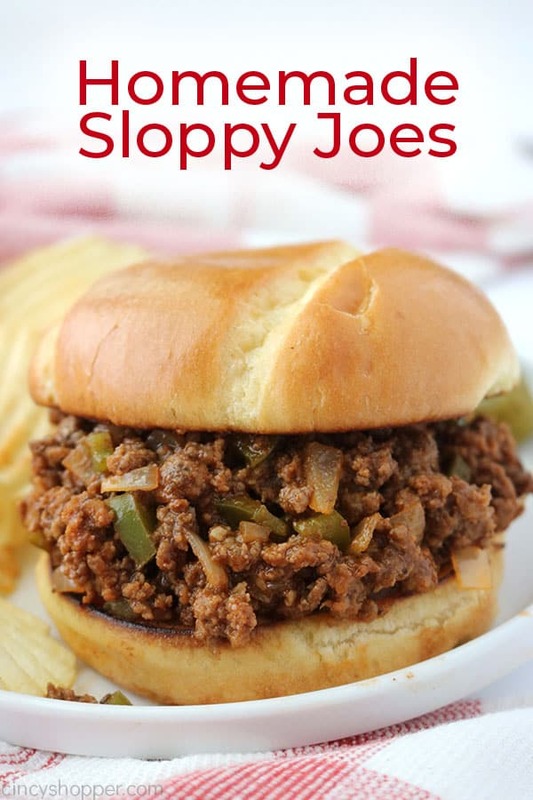 One of my favorite recipes to make when I need a quick dinner is Sloppy Joes. I grew up with them on the dinner table quite often and even as a kiddo, I really liked them. 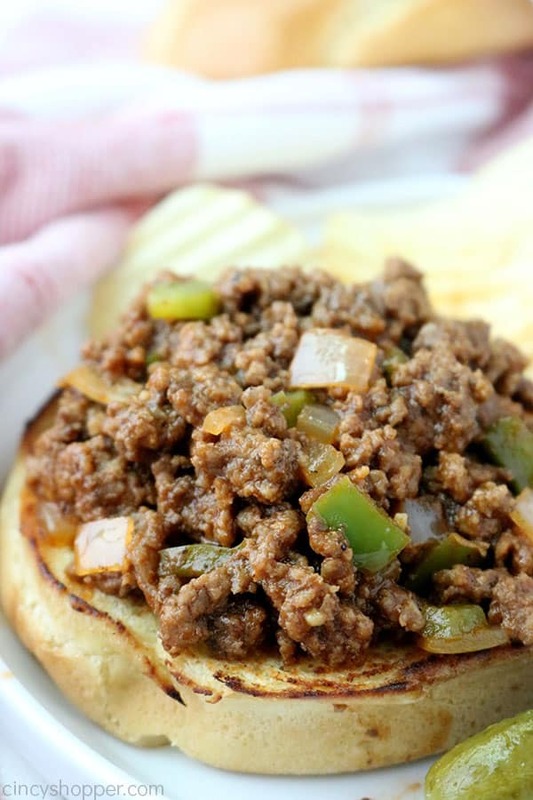 I was looking through my blog and realized I had shared my Philly Cheesesteak Sloppy Joes with you awhile back but I have not shared my traditional recipe for simple sloppy joes. Since I was needing to meal plan, I decided to add them to our menu this past week. 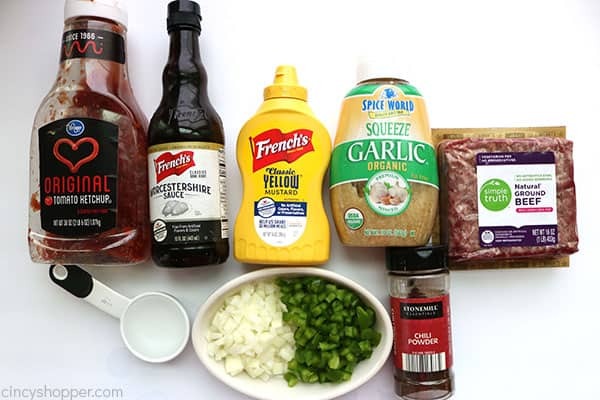 Many homemade Sloppy Joes recipes will call for tomato sauce, tomato soup, tomato paste, bbq sauce, there are so many different variations of the recipe. I keep my recipe quite simple with basic ingredients that I know I always have on hand. I use one skillet and it only takes about 25 mins or so to have on these sandwiches on the table. When my kiddos were little, I always bought Manwich sloppy joes in the can. That was way back before I started to enjoy cooking. Sure the store bought is very kid friendly but there is not any flavor in that can. Homemade Sloppy Joes are just as easy to make and no can is needed. 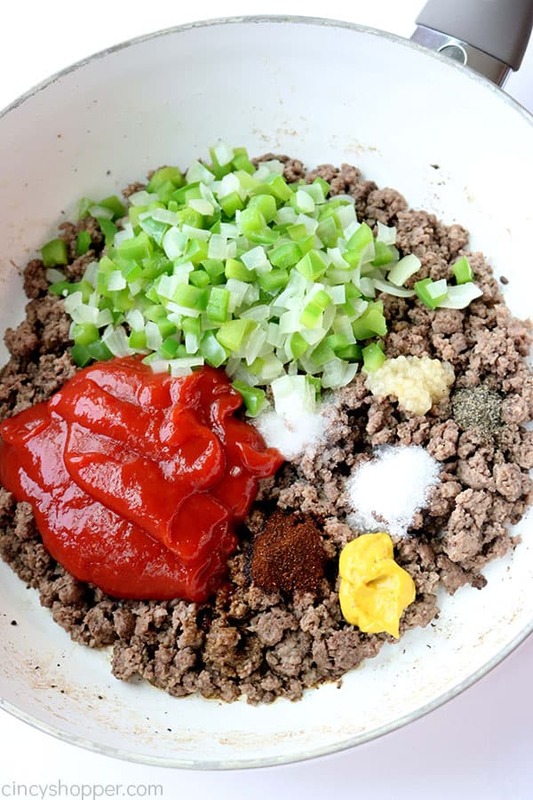 What ingredients do you need for Sloppy Joes? How do you make Sloppy Joes? Microwave diced onions and peppers for 1 minute 30 seconds. Set aside. In a skillet over medium heat, brown ground beef and drain. Cook over medium low heat for 15-20 minutes. 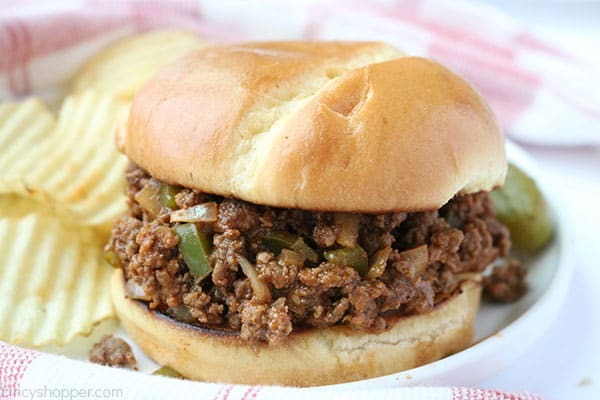 What bun is best for sloppy joes? We like to use a brioche bun. Store brand buns are good too. We lightly toast them with a bit of butter in a skillet or on the griddle. Toasting the bun really makes this dinner sandwich so much better. The toasting gives the bun a slight crunch to mix with the sloppy. If you do not have buns on hand, just use a slice of bread for a open faced sloppy joes. What side dishes pair well with homemade sloppy joes? 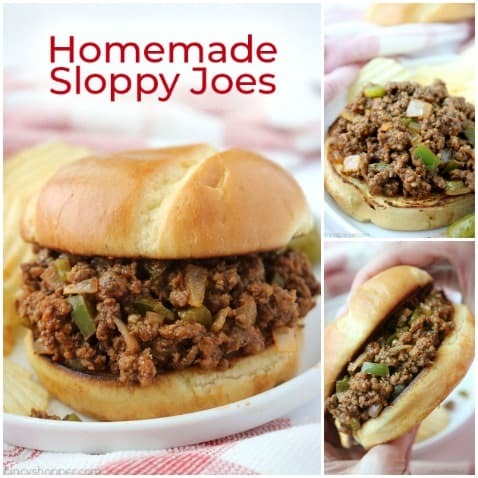 When I make sloppy joes, I am usually making them for a quick and easy dinner. I will serve them with potato chips and a pickle most of the time. They pair well with french fries, onion rings, tater tots, or even a side salad. Can I make sloppy joes in a CrockPot? 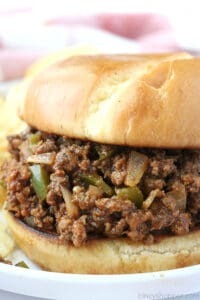 My homemade sloppy joes recipe can be made so quickly on the stovetop. If you prefer using your slow cooker, go right ahead. You will want to brown your ground beef and then toss it all in the CrockPot with the rest of the ingredients with a quick stir. Then just set your setting to low for 6 hours or cook it quicker in just 1.5-2 hours on high. Do I need to use Ground Beef? Can I make Homemade Sloppy Joes with ground turkey instead? For sure! My aunt makes this recipe quite often with ground turkey. You may have just a hint of a different flavoring but you will still have a great sloppy joe. I have not made this variation, let me know if you make it and if it is tasty. Can I freeze my Homemade Sloppy Joes meat? Most definitely! Go ahead and add your meat to a Ziplock bag (that’s what I use). Or grab a small resealable container. Having your sloppy joe meat in the freezer for busy weeknights is great. You can reheat in the microwave or stovetop. You can also place your sloppy mix in a slow cooker to get it to temp. Is this a kid friendly sloppy joes recipe? If you are looking for a kid friendly version, go ahead and omit this onions and peppers. The flavors will not be as great for us adults but will surely please the kids. You can also puree the onions and peppers instead of dicing. You will achieve the same great flavor and keep the kids happy too. Always toast your bun. The addition of the crispness with the sloppiness of the meat is going to make the best sandwich. As your ground beef cooks, chop away at the meat to make it as fine as you can. Having fine meat allows for the spices and flavors to cook in. If you prefer your mixture really sloppy, add in a bit more ketchup and a tad bit more water. If your sauce cooks too long and gives you drier meat, do the same. This recipe is very forgiving. We like ours sloppy but not too sloppy so this version is our family favorite. 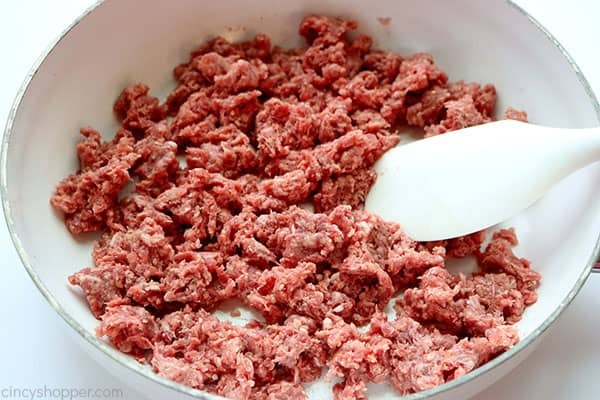 Looking for other ground beef recipes? Be sure to consider these other recipes I have shared. Do you have the sloppy joe recipe for instant pot version?? Hi Vicky! I do not currently have the instant pot version for this. I will add it to my list to attempt. Ooohh, you’ve just reminded me how much I used to love Sloppy Joes. I haven’t made them in years, so I’ll be giving your recipe a try in the very near future!